The antibody is a mouse monoclonal antibody against recombinant Human Myostatin Propeptide. The immunization antigen (28 kDa) is a protein containing 243 AA of recombinant Human Myostatin Propeptide and 5 extra AA (highlighted). Myostatin (GDF 8) is expressed uniquely in human skeletal muscle as a 12 kDa mature glycoprotein consisting of 109 amino acid residues and secreted into plasma. Myostatin is a member of the transforming growth factor β superfamily of secreted growth and differentiation factors that is essential for proper regulation of skeletal muscle mass. Studies have shown that myostatin could play an important role in cardiac development and physiology. In serum, myostatin circulates as part of a latent complex containing myostatin propeptide and/or follistatin-related gene. The myostatin propeptide is known to bind and inhibit myostatin in vitro. This interaction is relevant in vivo, with a majority (>70%) of myostatin in serum bound to its propeptide. 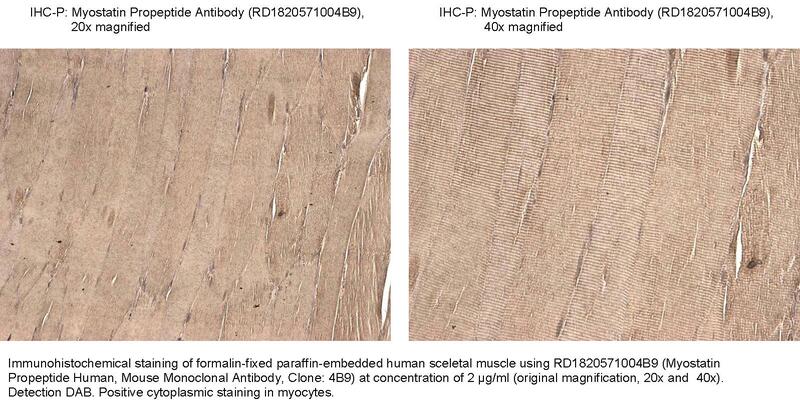 The myostatin propeptide is negative regulator of myostatin in vivo.